It's one of my favorite times of the year. Whenever I look at the calendar and realize that the Fourth of July is approaching, I long to make sugar cookies in the colors of our nation's flag. 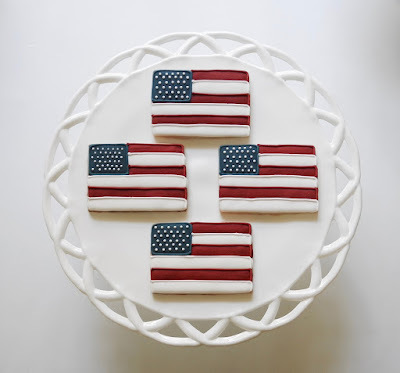 I've made several different designs of iced cookies in the past showcasing our red, white and blue, but nothing beats making flag cookies. Having a variety of star spangled banner cookies for your Independence Day celebration, is a great way to usher in the summer holiday. I love the way they look on white cake stands, such as these from my milk glass collection. While going through my cookie cutter sets, I immediately reached for some from Martha by Mail that I had never used before. 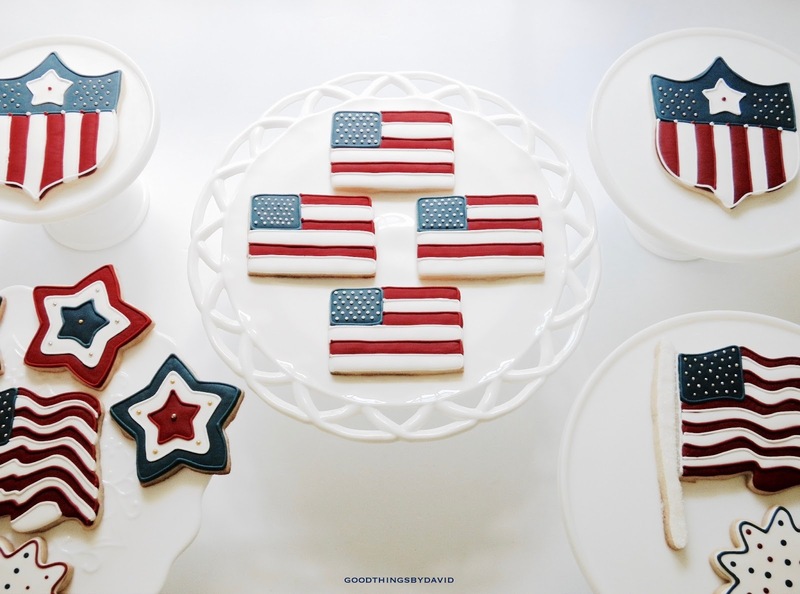 The large Flag & Shield cookie cutters are great for making generously-sized cookies, but you have to be careful with the flag's pole. It has a tendency to break off when releasing the cookies onto lined baking sheets (if it does, simply wedge it back into place before baking). 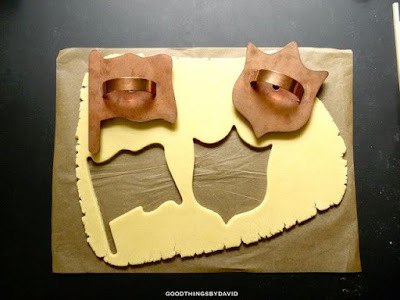 The other cookie cutters that I used were a star, a rectangle and a sunflower shape. My sugar cookie recipe is always reliable, tasty and easy to work with, and so is the royal icing. Mixing the right shade of navy blue and red royal icing is key. I like to add a little bit of black to these in order to darken them slightly. You must be extra careful, though, to add black food coloring in small amounts. 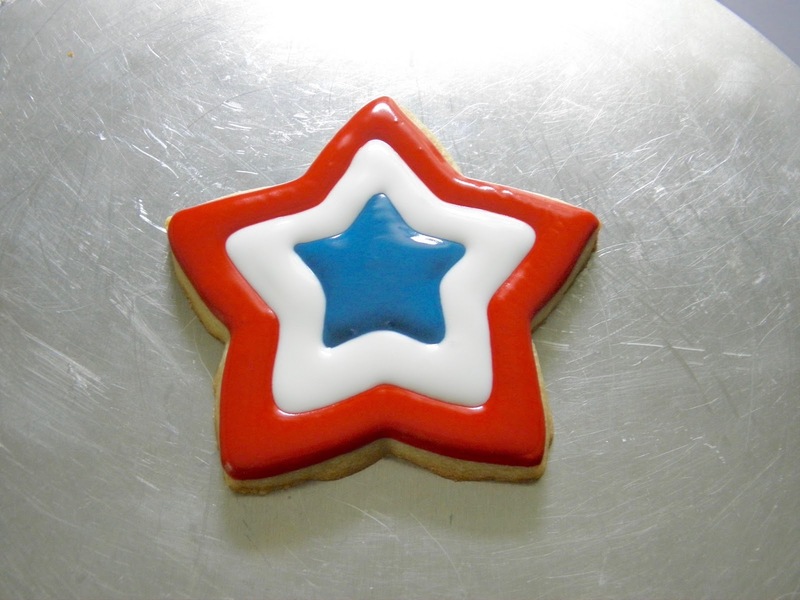 Usually one drop is enough to darken a two cup portion of red or blue royal icing. For the star cookies, I traced two smaller stars within the cookie, using food coloring markers, and filled them in with royal icing as shown. It's up to you how you arrange the red, white and blue colors, but I do advise you to fill in the middle star first, then work outward. 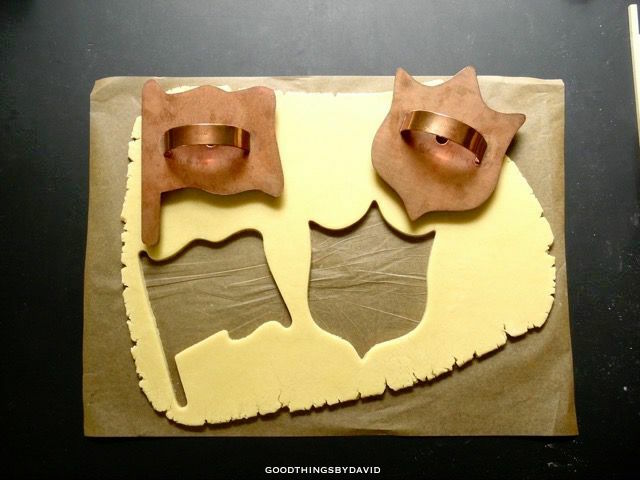 Once the areas are filled in with royal icing, it's up to you what you want to do with them. I placed silver drageés along the white areas of my stars while the icing was still wet. As you can see, the drageés are optional, but a nice touch. Outlining each star with a bead of royal icing is not essential, however it does give the cookies a nice edge to them. The sunflower cookies remind me of bursts of fireworks. These are made by flooding the bases with white royal icing. Red and blue dots are placed throughout the cookie while the base is wet. This is then left to dry completely before outlining the entire cookie in a contrasting color. Don't they look nice on this Fenton glass Spanish lace cake stand? 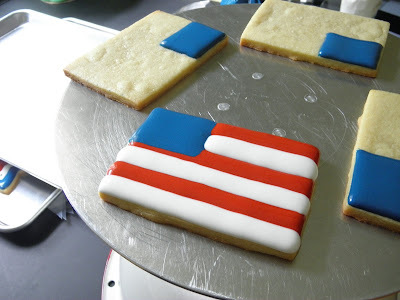 Large rectangles were cut out with Ateco cutters for these fun cookies. Using a blue icing for the canton, outline and flood a rectangle on the upper-lefthand corner. Using the white and red royal icings, pipe stripes down the flag. Don't worry about trying to fit thirteen stripes on these cookies. They're cookie representations after all. Let the icings dry completely before continuing. Note: if you want to carefully place silver drageés on the blue field, you can do so while the icing is wet. Moreover, white dots can be dropped into the icing while it's wet, should you wish to do so. 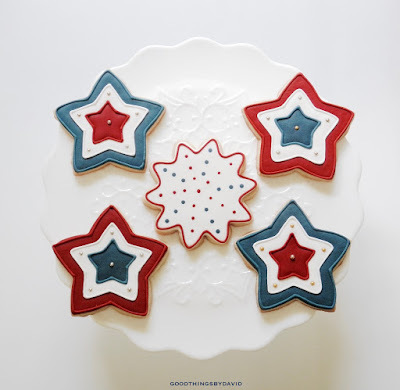 I piped white dots for stars on top of dried icing for these cookies. I outlined the canton and the stripes with beads of icing using a #2 plain round piping tip to give the cookies a polished look. The cookies sit proudly on my large Pitman Dreitzer Colony cake stand. Absolutely beautiful! 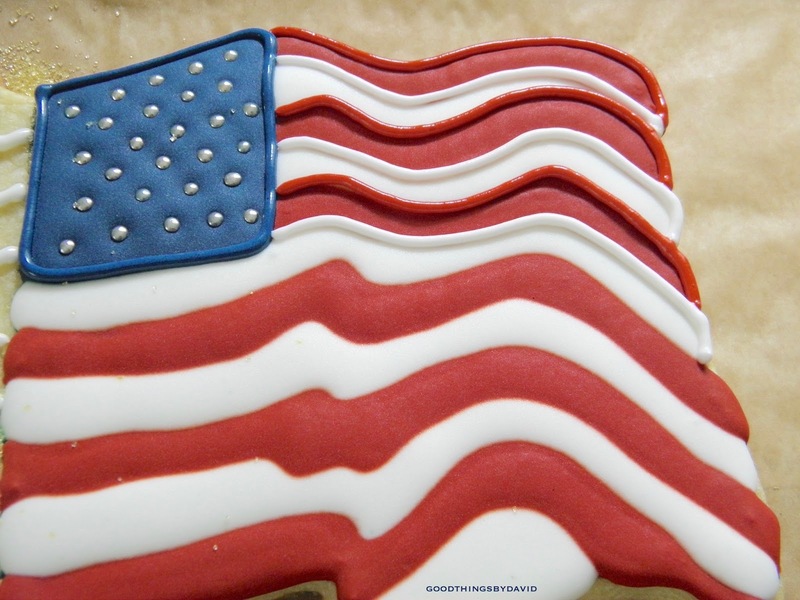 For the large flag cookies, I piped the blue canton and the stars and stripes in the same manner as the rectangular flags. Because the Martha by Mail flag cookie cutter has that undulating shape, it makes sense to create waves in the stripes. This closeup of the cookie shows you how I applied the beaded borders of icing along each stripe of the dried base. Not necessary by any means, but I think they're quite spiffy this way. The flag poles were simply iced with a white icing and were dredged in clear sanding sugar. Our nation's flag has never looked sweeter in my opinion. Next to that firework burst, I think that they're going to be popular with the lucky friends of mine who are getting some this year. My interpretation of an American patriotic shield is very easy to do. Trace a small star shape in the middle of the shield, toward the top, using a food coloring marker. Outline and flood the star in white royal icing. 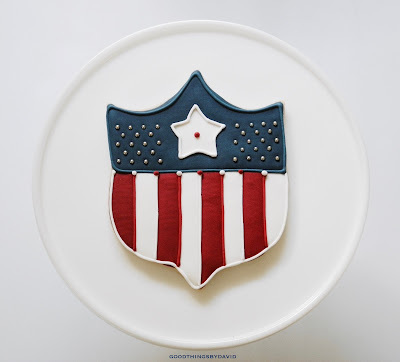 Immediately outline and flood the top third of the cookie in navy blue royal icing; while the icing is still wet, carefully place silver drageés as shown. Pipe alternating rows of red and white royal icing as shown Let the entire cookie dry completely before adding beads of royal icing along the canton, the center star, and stripes, as shown. 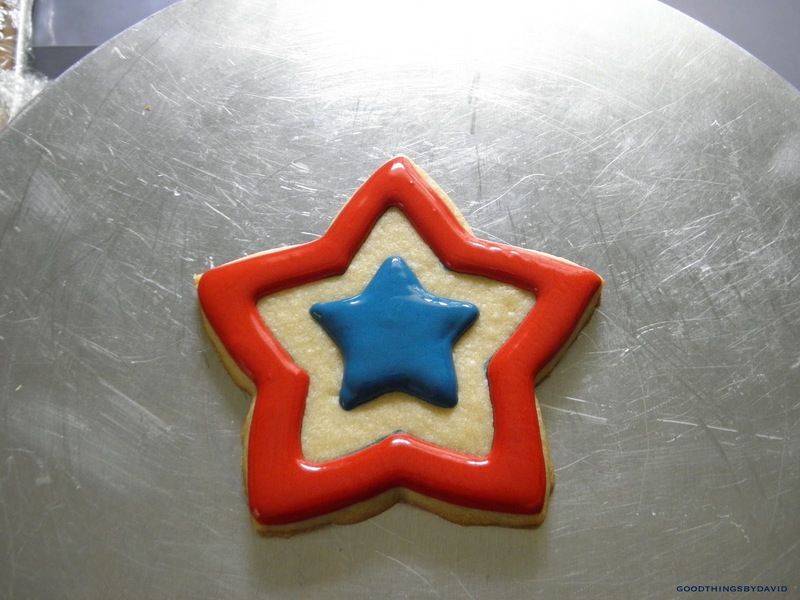 Star spangled banner cookies are great to commemorate our nation's independence. 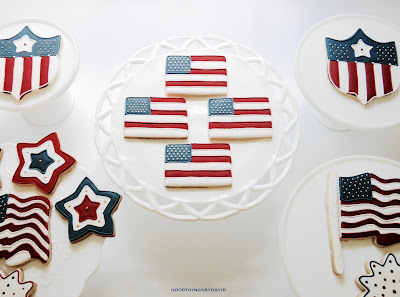 Now that I've shown you how easy it is to make some festive and patriotic star spangled banner cookies, gather a few cookie cutters and make a couple of these for your Fourth of July celebration. Bake extras to hand out to family members, close friends and to anyone who needs a bit of sweetness in their life. It's a guarantee that they will be a hit with everyone. Your cookies are always impressive and fun. 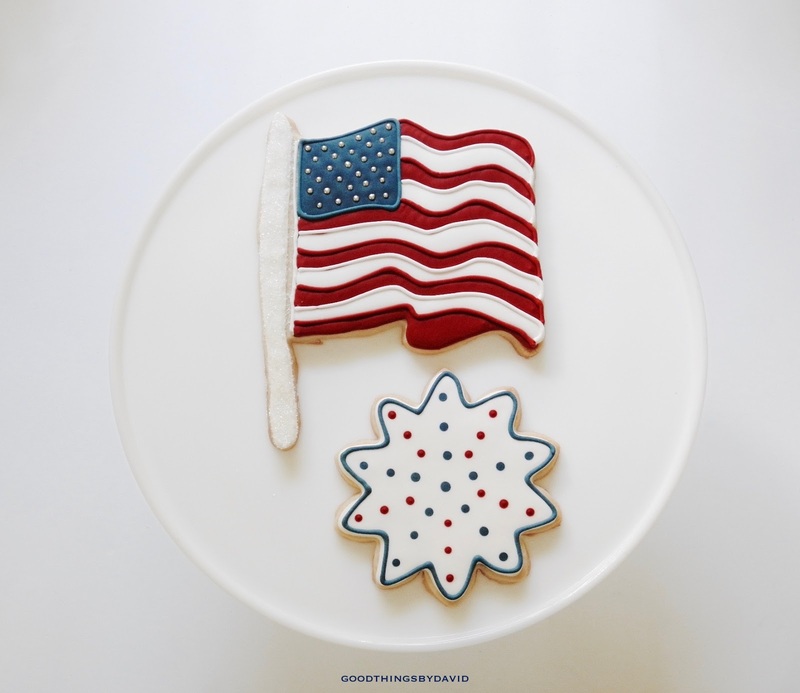 Imagine if we could have parties all over the country, and especially in DC, and there were enough of these cookies to go round, and we all sat down and ate cookies and lemonade together. Maybe we could all get along. You can't not smile when you see these. Love the creative use of the sunflower for fireworks. The cake plate is definitely the perfect choice to display your exquisite cookies. What a nice compliment, jusaweecatnap!! It would be nice if we could all share a bit of sweetness together instead of fighting and being so divisive. We should start a cookie movement! I hope you and your loved ones have a great Fourth of July.